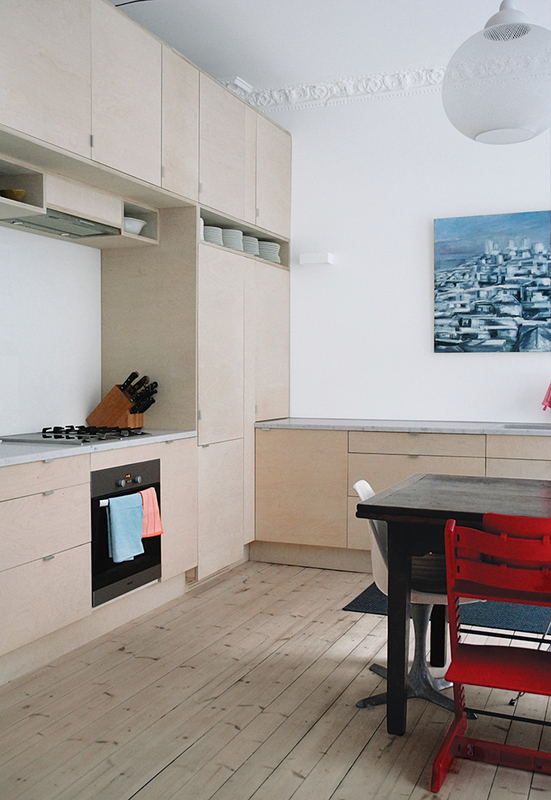 Norwegian architect Casper Mork-Ulnes and his wife, American furniture designer Lexie Damner Mork-Ulnes, tackled a renovation of their 1,300-square-foot apartment in Oslo. To lighten the space, they treated the floors with Flügger’s Trelut lye, then sanded them, oiled them with PNZ Objektöl, and finished them with two coats of wax. 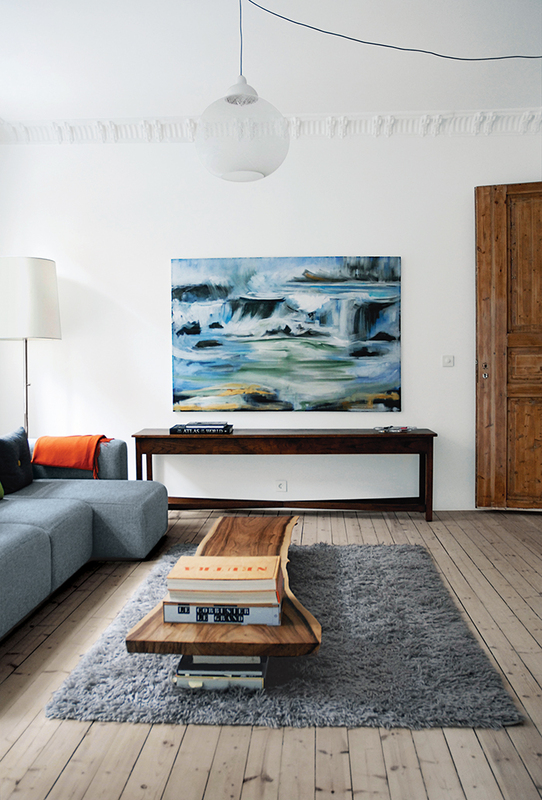 In the living room, a reclaimed Indonesian hardwood slab from Buka Design + Hardwoods is the de facto coffee table and the painting is by Casper’s mother, Randi Mork-Ulnes. The gray Mags sectional sofa is from Hay. The goal of the renovation was to get the most out of every square inch, since there was no way to expand beyond the apartment’s historic envelope. Always-open double doors—stripped down to their original wood—connect the railroad-style parlors to create an open, loftlike feel. In the playroom sits a 1960s-era white leather Model 67 sofa by Florence Knoll. Also in the playroom is what Lexie calls a “large, cushy” West Elm rug for “family dillydally." Planning more storage was critical. “We used custom fir plywood doors to make the Ikea cabinets under the marble countertops special,” Lexie says of the kitchen. Joining simple white chairs around the dining table are red Tripp Trapp high chairs from Stokke—the same model Casper had as a child. The 22-square-foot bathroom had no windows, which is common in Oslo apartments; new clerestory windows help illuminate and expand the space. Additional storage was added under the master bed to replace the closets lost in the renovation. Casper and Lexie Mork-Ulnes in their newly renovated home. Inspired by brightly colored doors in Notting Hill, London, Casper and Lexie chose a few distinct hues for interior doors in their renovated apartment, such as blue Flügger paint for the laundry room door. A translucent glass backsplash in the kitchen lets light into the bedroom. After several years in San Francisco, Casper Mork-Ulnes, a Norwegian architect, and his wife, Lexie Damner Mork-Ulnes, an American furniture and interior designer, decamped to Oslo. The draw? A chance for Casper to open a second office of his firm, Mork-Ulnes Architects, and for the couple to raise their children, Lucia, seven, and Dagfinn, five, close to great skiing and to the family farm, a half hour south of the city. “Despite the fact that Casper would need to fly back and forth to the San Francisco office, Oslo sounded like utopia,” Lexie says. However, their affordable fixer-upper wasn’t quite utopian. For one thing, it was depressingly dim. Although the three lofty living spaces, arranged as an enfilade, had big, glass-paned casement windows, little sunlight pen-etrated them during winter. Two small bedrooms and a tiny kitchen opened onto a dark interior courtyard that saw even less light, and the entry hall was windowless. The couple pulled off a six-month renovation for under $200,000 with help from a Polish handyman who lives on the family farm as well as building materials from Norwegian big-box stores like Maxbo and ByggMax, Baltic birch plywood shipped from Poland for half of what it would have cost to purchase it locally, and paint from Flügger. Hitting a fine balance between clean-lined, white-walled Nordic minimalism and a California-inspired penchant for textures and organic forms, the design duo took their home from dark to light and from cramped to orderly. Here’s how to replicate the Mork-Ulneses’ best design moves, from controlled color to the perfect pale wood finish. Although Lexie was concerned about maintaining privacy in their ground-floor apartment, Casper says, “The most obvious way to bring more light in was to eliminate curtains on the front windows”—and to move all the public rooms, including the kitchen, to the front of the apartment. The architect then cut out sections of the interior walls to form clerestory windows, which bring natural light into the bathrooms, hallway, and bedrooms in the back of the apartment. These windows “allow the ceiling to flow visually from one room to another, thereby making the spaces feel bigger and connected,” Casper says. During their early months on the family farm, near Oslo, the couple embarked on a few DIY projects, including building a 12-foot-long Norwegian spruce bench that doubles as a catchall for shoes in the front hallway. “In Norway, you come in with your feet covered with snow, and shoes have to come off right away,” Casper says. The wood plank was milled from a tree on the farm. “Furu [a soft pine] is not an ideal wood for furniture, but it really works in this space since it matches the floors,” says Lexie, who once worked as a furniture designer at Pottery Barn Kids. To lighten their floors and cabinets, the couple first sanded the wood; then coated it with Flügger lut, or lye, which removes any pinkish hue; and then applied white oil, which removes yellow tones. “Lut is commonly used to cure dried Norwegian cod, but when you use it with white oil, it results in a brighter, bleached white color,” says Casper. They finished the wood with a coating of hard wax and white oil that seeps in and hardens to form a protective layer.